Joyeux Noël! I’m sorry for the lack of updates, I just came back from Korea a few days ago. It was a great and memorable trip, I’ll try to upload some photos when I have more free time. Meanwhile for this year’s Christmas, I had a chalet with my closest friends. 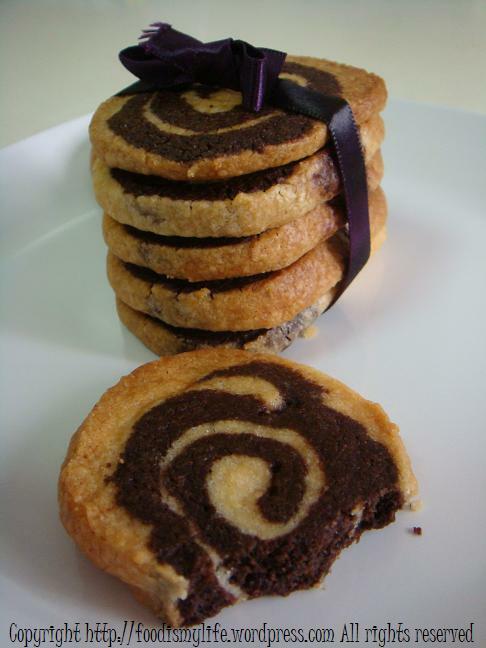 Due to the lack of time to bake and prepare fancy desserts, I baked these spiral cookies in which I prepared the dough a week ahead, just before I leave for Korea. It’s pretty simple – make two doughs, one flavoured with vanilla and the other with chocolate; roll them out then pile on top of one another and roll together; wrap them up and pop them into the freezer until ready for baking. These cookies are very attractive and they are at the same time, very yummy too. They were all – except a few that I salvaged for myself – gone in a couple of hours after I brought them to the chalet. 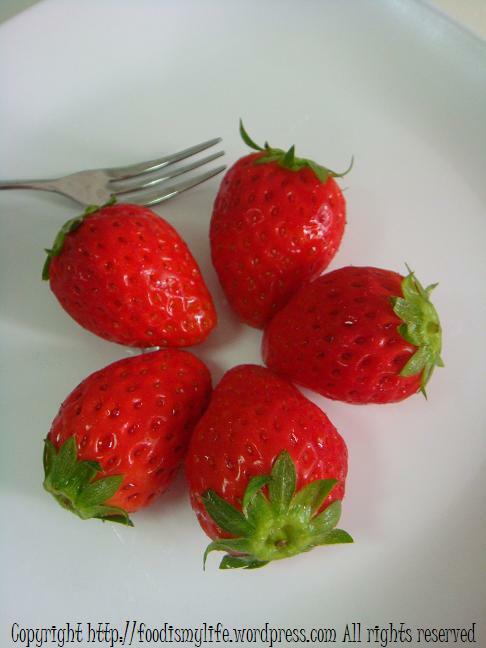 And from Korea, I brought back the most seductive and tasty strawberries I have ever seen and tasted in my whole life. They are so sexily red and heavenly sweet. They are also extremely delicate to the touch and the slightest pressure will result in a dent in these beautiful strawberries. 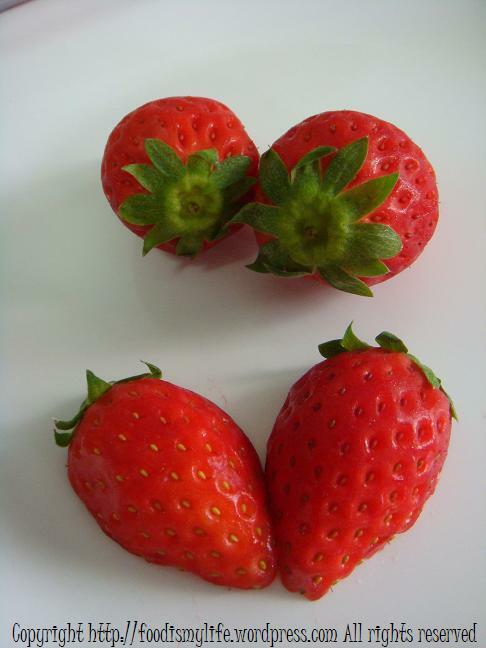 Okay I may seem to be exaggerating, but it is THAT difficult to find such beautifully sweet strawberries in Singapore. All I’ve ever tasted are sour and 3/4-ripe strawberries, and these Korean strawberries are by far, the best I’ve ever tasted. I’ve frozen a batch and i’m still deciding on what to do with it. As for the other batch, I’m keeping it and going to start on a strawberry tour of baked good. Prepare the vanilla dough by beating the butter and sugar in a medium bowl until soft and creamy. Add the vanilla, egg, and flour into the creamed mixture and stir until it forms a soft dough. Repeat and prepare the chocolate dough in the same way. Knead each dough separately until smooth, cover in plastic wrap and chill for 30 minutes. Preheat the oven to 180 degrees Celsius. Line baking sheets with parchment paper. Cut the roll into 24 to 30 slices, arrange 4-cm (1 1/2-inch) apart. *** Bake for 10 to 12 minutes until pale golden. Remove from the oven and cool for 5 minutes. Transfer to a wire rack to cool completely. *I used beaten egg white instead. **At this point I wrapped and freeze the dough for 1 week. I thawed the dough overnight in the fridge. ***The cookie did expand a little during baking, so make sure there’s sufficient space for it to expand!